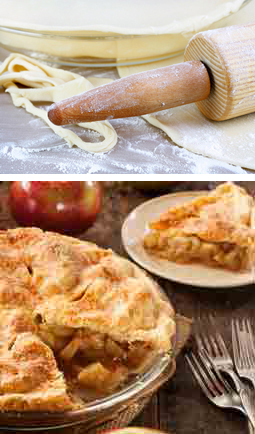 Mother's Apple Pie - A recipe from Savor California, the online showcase for extraordinary gourmet foods and beverages from California. Giusto's Snowflake All-Purpose Unbleached Flour is made from all-California grown wheat. Sift, then measure the 2 cups of flour. Resift with 1 teaspoon of salt into a large bowl. Measure 1/3 cup of this salt-flour mixture into a separate small bowl. Stir in water to form a smooth paste. Cut shortening into the flour mixture in the larger bowl with a pastry blender, until the grain is the size of small peas. Stir the flour paste from the small bowl into the dough. Work it with your hands until it is well incorporated and the dough forms a ball. Roll out to make two round crusts. Peel, core, and cut the apples into very thin slices. Combine the sugar, salt, cornstarch, cinnamon, and nutmeg. Note: only very tart apples require the larger amount of sugar, and only very juicy apples require the larger amount of cornstarch. Stir the sugar mixture into the apples and toss with your hands to coat all the slices. Layer as tightly as possible in the bottom pie crust. Dot with chunks of butter. Top with the second crust and prick holes with a fork to vent. Bake the pie in the 450-degree oven for 10 minutes. Reduce the heat to 350 degrees, and bake until done, about 1 hour in all.